Help wanted: I'm no longer playing, so please help with creating Pull Requests on GitHub. If you are an author or programmer and if you are interessted in taking over this project, please let me know. ArcHUD displays smooth arcs around your character in the middle of the screen to inform you about the health and power (mana, rage, ...) of you, your pet, and your target. In addition, it shows casts, combo points, holy power, soul shards, and a couple of other things. It discretely fades when you are out of combat and at full health/power. This is a continuation of ArcHUD2 which managed to survive various patches... until the Cataclysm. Thanks to Nenie, the original author of ArcHUD2, for supporting me with this new version. Please report any bugs or feature requests via the ticket system. Custom (de)buff arcs: Ever wanted to keep track of the stacks and/or remaining times of some specific (de)buffs such as Evangelism, Savage Roar, Beacon of Light, Weakened Soul, etc? Then just create your own custom (de)buff arc for it! "...nothing ever quite matched the smooth, clean simplicity of ArcHUD's graceful rings." "Great job!! I've used this addon for years! None of the other HUDs come close to the functionality and elegance of ArcHUD." "Thanks for the work on it so far, much more lightweight than IceHud!" "Was staring at the various icehud/metahud alternatives with discomfort and sadness right after the patch [4.0]." "Awesome! Thank you so much for that miracle!" "Thank you so much for continuing this fantastic addon." "...nothing could compare to ArcHUD..."
"For a whole 4years I had this mod and I missed it so much in the passed few weeks. I tried other HUD mods but they were too in my face >.< . Best HUD mod IMO! 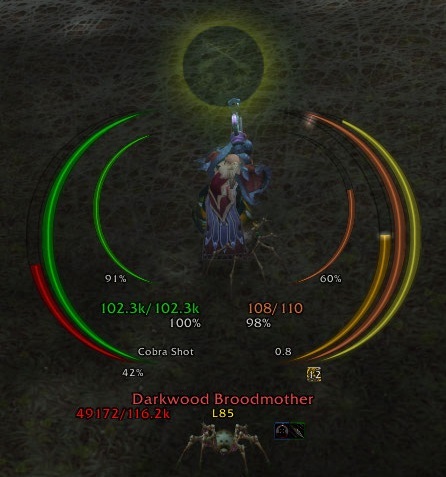 Thanks for resurrecting an old friend :D"
"Loving the new ArcHUD my favorite HUD by far :)"
"I don't think I could play wow without this addon :)"
"I've actually grown kind of dependent on it because I'll occasionally run out of Mana/ die without this." "Hey mate, just came to thank You again for taking over this beauty, awesome job!" "THAT addon! So long I have been searching for a replacement when the development stopped, thanks for bringing it back to live!" How do I add a arc for a specific buff/debuff (remaining time & stacks)? Where is my Combo Point/Soul Shard Numeric Indicator? PS: Nyyr you are a lifesaver. This is simply the most important addon for WoW. You roxx man! You may have another try with r8. If this doesn't fix it, you'll need to wait until I rewrote this part. @iam5ya: Hm, strange, never happened to me, but definitely was a bug. Please check if the current version works for you. If it only occurs occasionally, don't worry too much - this is related to timer code which will be changed soon. @pappaman: This will come back as an option when the options menu is complete. One thing I would ask is if there's an option to actually move the arc wherever I want or if it's still in developement, as well as the options to spread the arc or make it bigger or smaller. Thanks again! You gentlemen are my heroes! Thank you so much for continuing this fantastic addon. Please feel free to include a paypal link or something similar so I can show my appreciation. Thanks!